Mayor Jim Watson and Councillor Diane Deans, Chair of the Community and Protective Services Committee, held a community celebration at City Hall today marking the first 250 participants to secure permanent housing as part of the Housing First initiative, a priority of the City’s Ten-Year Housing and Homelessness Plan. Housing First finds permanent, affordable housing for individuals experiencing homelessness and provides the support services and connections to community-based help that people need to stay housed. 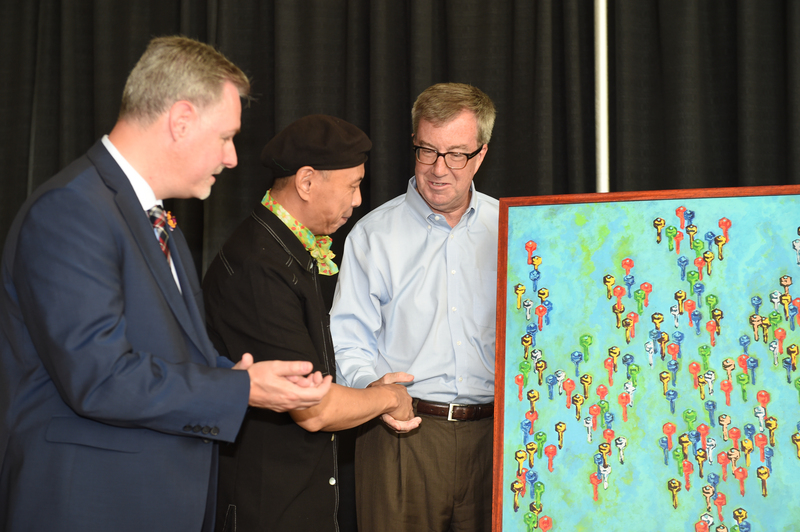 As part of the event, a painting entitled ‘Transitions’ was unveiled representing the journey from homelessness to being housed. Local artist Chi Wei Lee developed the artwork drawing from his own personal experience with homelessness. It was framed by Mark Andrew Buttigieg and will be hung in Jean Pigott Place in City Hall. Council approved A Home For Everyone: Our Ten Year Plan 2014-2024 in 2013. The plan focuses on three priorities: everyone has a home, people get the support they need, and working together. The overall objective of the plan is to eliminate chronic homelessness by 2024.